I have friends who do not celebrate Christmas like I do. They don’t have all the tinsel, lights, the tree, the stockings, the Santas, the blue & the gold & the silver, the candy dishes & Holiday coffee mugs, the reindeer: they don’t go in for any of that. These are not all my non-Christian friends. Some of them are Christians. They have varying reasons: they don’t believe in the commercialism, they aren’t sure that December 25 was the date of Jesus’ birth, they disdain the mix of pagan symbolism with Christian symbolism, they prefer a simple day. It doesn’t matter what their reasons are. It doesn’t even matter that they don’t go all out with the tree, trimmings and outside lights. I have non-Christian friends who go all out in that department. Today as I was busy unloading my boxes and boxes of Christmas stuff, I began to think about what draws the line between those of us who display all the red-blue-green-gold-silver of the season and those of us who do not. It isn’t faith in Jesus Christ. It is something else: memories of childhood, perhaps? An attempt to capture magic? A wistful nature? I cannot speak for those who do not load their tree with tinsel, lights, precious ornaments, and dog (or cat- or child-) warning jingle bells along the bottom. I never was one of those people even before I was a believer in Christ. I was always a believer in Santa. Every year there is a conversation among my closest Christian friends about how one celebrates and why. I can never adequately answer the questions of the most fundamental of my friends. I never had a problem mixing all the metaphors of Christmas: Santa kneeling at the manger, Jesus with the two broken hands, all my stuffed animals piled up in a make-shift Nativity where Teddy Bear and Pinky Cat represented Mary & Joseph and Lucky Dog was one of the Wise Men and Cecil the Sea Monster was a Poor Shepherd Boy. The first time I ran smack-dab into Christian fundamentalism, I had been a Christian for 15 years. I had no idea there were Christians out there who associated a tree with paganism. As it happened, Don & I were temporarily living with a couple who refused to have a Christmas tree. I remember telling Don that we had to have our own apartment before the holiday because I was *not* going to have a tree-less Christmas. I really didn’t care how logical the argument was. Christmas is as much about the traditions as it is the faith. It’s about little podunk church programs with little kids dressed in haloes and tinsel wings and a Mary who doesn’t know how to hold a baby doll. It’s about the lights in the yard, however hokey. The polar bears, the meese (plural for moose in my family), the reindeer, the many faces of Saint Nicholas. I love Rudolph. And not because Gene Autrey recorded the hit before Burl Ives although that could be a very good reason to love Rudolph. Have you ever looked at a young Gene Autrey? Oh yeah. Besides, he had a gorgeous horse, prettier than Trigger. I love Frosty the Snowman but not as much as I love Rudolph. I love Santa. I love fat Santa in red, I love Saint Nicholas, I love Father Christmas. I want to take an aside here to point out that no matter how I tried, my children saw the world in black and white. They never believed in Santa. Flying reindeer were not even myth: they were fantasy. They were as impressed with Santa as most of us are impressed with the Easter Bunny. I am not into Christmas to get gifts. I really don’t care much about the gifts part except if you are going to get me a gift, make it totally useless and surprise me. I don’t want to know ahead of time what I am going to get. I like the surprise more than the gift. My husband, on the other hand, wants a specific item and is disappointed if you digress. I tell you all of this because I will probably blog about Christmas and decorations this month. It’s just what I do in December. Today I put up the tree. And for the first time in 3 years, I got out every single ornament we own and put it on the tree. 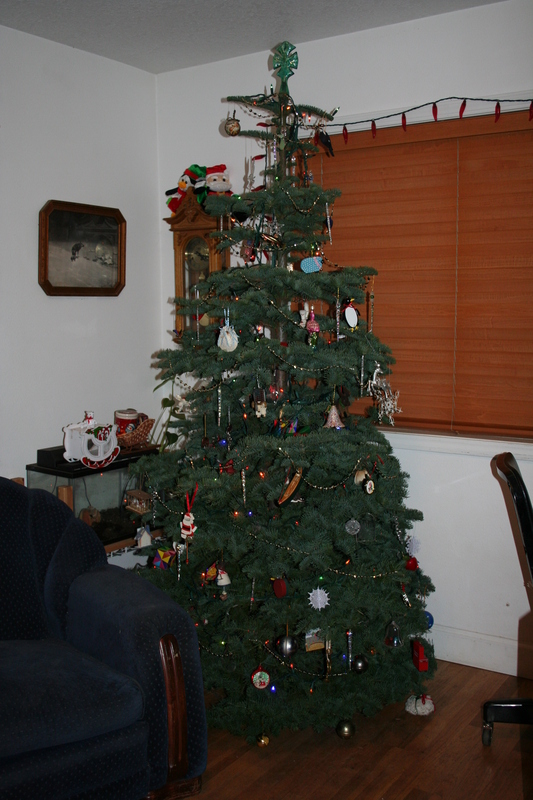 It is a very good thing it is a very full Noble Fir: I have a lot of ornaments. In four weeks, I will be loathe to take this memorial down. That’s what it is for me: a memorial to God. A memorial of my life. Of our life together (Don & I). A celebration of a time in life when magic is afoot. I don’t mean the magic of Hallowe’en, but a magic that runs deep in the blood of mankind, a magic that wants to believe in goodness, peace on Earth, and something larger than we are. A magic that transports us back to our childhood and the innocent moments where we loved each other unconditionally. Real magic, sans Harry Potter. Harry Potter, by the way, celebrates Christmas. But that is an entirely other blog post. Beautiful post Jaci. I too, love Christmas. I’m sure it’s a childhood reminder for me. Dad loved Christmas and it was always such a wonderful time of year for our family. Christmas has many mixed feelings for me. I appreciate your celebration. And thank you for sharing some of those memories. Interesting post…..I still love Christmas too! And Santa, and…. Want some more ornaments or tinsel or lights? I have plenty! Remember how we had to separate the tinsel (real aluminum tinsel too!) and put each individual strand on? Of course we had to take each one off too, because we recycled the stuff. It’s interesting this year on my street. The arch isn’t up and only one house has any decorations out…yet. Oh, how I love Christmas. It really is “the most wonderful time of the year.” For me, it will always be first and foremost about the birth of the Saviour and the enormity of that miracle….and the reason why. If I didn’t believe that, I probably wouldn’t bother with Christmas at all. Everything else is nice, and fun, but not particularly important. Thanks for sharing your thoughts about the different observations and traditions of the season, and the nostalgic childhood memories, especially the stuffed animal nativity. I’m with Arwen & Levi. Even as a tiny child, I was cynical about the Santa character. If he was real, why would the gifts that said “from Santa” be written in my Mother’s handwriting? Did she think I was dumb or what?? Your tree is beautiful. I hope you have room for one more ornament, because it’s on it’s way this week. I hope you like it! I adore Christmas and like you, don’t have any problem reconciling any of its traditions with my faith. Now if I could just find time to get my tree up!